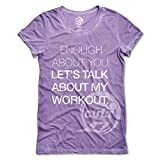 You know you’re dying to talk about your workout; embrace it! Make people smile with this high-quality, slim-fit tee. It’s soft as air and as smooth as silk and is destined to become your favorite shirt from the first time you pull it on.